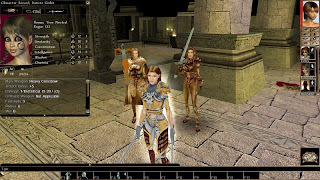 I've recently found myself back in the mood to play Neverwinter Nights, and in returning to the game I've realized that I've never gotten around to posting more about it here despite the fact that it's one of my favorite games. I won't waste your time or mine doing a lengthy review of the game; it's been around long enough now and enjoyed enough popularity in its day that most gamers should already know what it is -- and if they don't, more info on this Dungeons & Dragons game can easily be found. 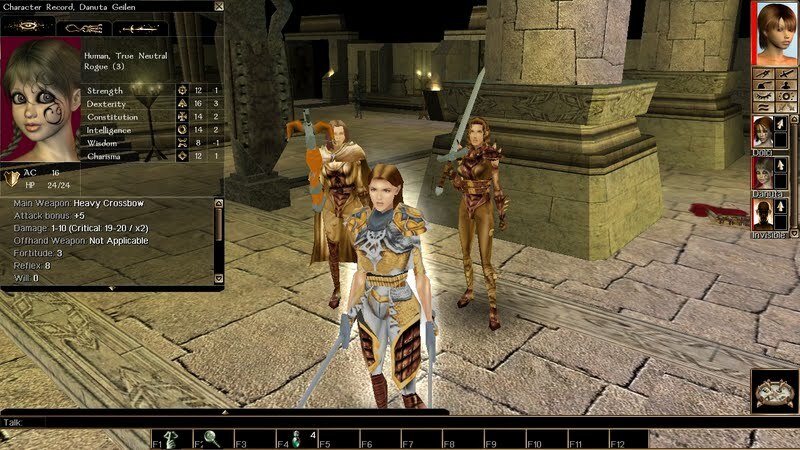 In this post I want to instead focus upon what is perhaps my favorite mod for Neverwinter Nights. Like many of my other favorite games, one of the things I love about NWN is that there's a modding community that has produced for it more custom content than you can shake a +1 Longsword at. However, it took me a while getting around to enjoying the game and its massive library of mods because I thought that it was exclusively a MMORPG. While I might enjoy playing such a game with a few of my close friends, our schedules and interests rarely align to make such things possible; aside from that handful of gamers, everyone else I've met on the internet has proven to have drastically different ideas about gaming and it's likely we'd be unable to cooperate long enough to play an entire chapter of NWN, let alone complete the entire story. Imagine my surprise when I discovered that NWN has a single-player mode in which one can complete the entire game! This is where the OHS Henchman System becomes invaluable to players like myself. While the default game limits the number of cohorts a player may have and restricts the player's level of interaction with said cohorts, OHS allows the creation of a party of as many custom cohorts as the player is willing to keep track of. Furthermore, no modding tools or knowledge are necessary to accomplish such a feat; everything is handled in-game through dialog that avoids breaking immersion as much as possible. The mod comes with a variety of pre-made cohort characters that can be summoned from the start of (almost) any module, but I prefer to play with a party of characters of my own creation. The easiest way I've found to do this is to use OHS in conjunction with a character-creation module like PGC3 (and there are several others) to create player characters, save them in the local vault and then register them as henchmen which can be summoned whenever I need them. While these cohorts are not as advanced in AI or as varied in appearance as the companions we've created and enjoyed in many newer games, they are sufficient to fill any roster vacancies in one's adventuring party. Most importantly, the behavior, equipment and level progression of OHS companions can be controlled and managed entirely by their party leader (that's you). I've been so pleased with the performance of my OHS companions that since discovering the mod I've never again used any of NWN's provided cohorts. In fact, I've become so accustomed to adventuring with sisters Dolci and Danuta (a barbarian and a rogue, respectively) that at times I forget that they aren't a natural part of the game. So if you need an adventuring party for Neverwinter Nights but all your friends are playing Modern Warfare, or if you're just tired of Tomi Undergallows and Boddyknock Glinckle, I highly recommend that you check out the OHS Henchman System. OldMansBeard has done an exceptional job with the mod and deserves all the praise he has received. I feel that OHS has added a new dimension to my NWN experience and I'd wager that you'll enjoy it as much as I have. I call shenanigans. It's been awhile, but I'm pretty sure female barbarians are supposed to go into combat in nothing but an animal skin thong and boots with four inch heels (though a tasteful helmet is sometimes permissible). You have that one fully dressed like a normal person! On a more serious note: that is certainly an interesting find. I quit paying attention to the NWN modding community in 2004 or so -- shortly after a short stint playing it as the MMO you mentioned not liking the idea of (and a good call that is on your part) -- but I had no idea a mod like this was even possible. I made some followers myself (I know; surprise, surprise) via the normal toolset method, and they had to be added to the individual modules to be recruitable. This meant you couldn't carry them with you between chapters without editing said chapters (which while not something Bioware wanted you to do, was totally possible and something I did on multiple occasions). Still, followers were a bit much work originally, so I ended up just playing in ways where I didn't need them. Necromancy FTFW, as the kids say. That summonable Lich is one of the best companions you can get in the base game. Quiet, mean, obeys orders, and loves to open fights with an AoE spell that kills off most members of low-level groups instantly. ...why yes, I do like mindless minions in D&D games, why do you ask? Can't forget Evil!Aribeth, either; who they finally gave a real personality to after years of her being the whiny not-really-a-paladin. She was fun. Buggy, but fun. Resist roll failed (2). Downloading. What? Somebody read one of my blog posts and was actually interested by it? I did actually spend about twenty minutes reading the OHS player's guide (I know, it always weirds me out when someone reads the directions, too -- even when that someone is me). Seems complex at first glance... but I remember having to make them from scratch -- creating and linking dialogue, scripts, tokens; compared to all that, having to type in some commands via chat window is no big deal. I just wish more people would make in-game command lists; since lots of games don't care for alt-tabbing in and out when scatterbrained players like myself forget the commands and didn't have the foresight to do something silly like write them down. Also: it just occurred to me that I haven't played NWN in a year; and thus it didn't have display set up correctly for my new monitor. Looks like the game has native widescreen support. Now you've got me wanting to reinstall NWN again. I never could find anyone to play the multiplayer mods either. I wasn't fond of the original campaign though I heard it's really more like a demo of the toolkits capabilities than something you're actually meant to play. As for alt-tabbing, I have a cheap netbook next to my monitor for e-mails and, er, stuff. Like most other games, the original campaign has its good and its bad; also like most other games, it just gets better after the release of a few official expansions and a toolkit. I'm still sorting through all the modules I've downloaded, trying to decide which I should play next. I have not played NWN for a while now, and I am not even certain that it is still installed on this computer (checks system), nope, not there. When I had first started playing it, I ended up downloading mods for it like crazy. Decided to back up my game content and all the mods, and it took one single layer and one dual layer dvd to do so. When I typed this post I was actually thinking of playing through the BioWare modules again, but I already know so much of what's coming that it's boring so now I've decided instead to play a pair of modules called "A TANGLED WEB" with a party of five sisters I've created. I highly recommend that you give OHS a try, especially since I know you're like me in the loving to create characters department. Also, it's nice to hear that I'm not the only one who does the double-layer DVD thing. A large part of my collection for NWN involves remakes of the original modules for Advanced Dungeons and Dragons, many of which I had, or still have, in my possession. It occasionally comes in handy to have a hard copy reference for the adventure I am playing through, for when I get stuck. Though I'll admit that, having actually played some of those P&P modules the old fashioned way myself, as I'm playing the NWN versions it's hard to suppress my "above-board knowledge". One module that I haven't played yet but am looking forward to is the NWN adaptation of the old DOS game EYE OF THE BEHOLDER. That should prove to be quite interesting. Thanks for reminding me, I've seen a couple of those and meant to try them out. Though I played EotB on the Amiga back in the day. BTW, I heard that some ScummVM devs were looking into or even working on an EotB engine. Guilty on both counts, but if I end up spending 30 minutes or more looking for a secret door that I know for fact is supposed to be there, I'm pulling out the original module for reference. You don't have to of course, but my doing so has found game breaking flaws in a couple of modules I was playing. Read: the secret door was not there or not properly triggered to allow you access into the next room/corridor/whatever. I have to confess, that's one of the main reasons I never got big on fan made modules for NWN, even years ago. You're not playing the digital version of the original -- you're playing some guy's interpretation of it; usually including his/her "fixed" writing, and other details changed "to make more sense". Actually, most of the digital remakes I have played through, and that I am familiar with the originals of, have been rather "spot on" within the limitations of the game engine (lack of flight and climbing as examples). Some have deviated somewhat from original, but I have been able to enjoy them as well, as long as said deviation was not excessive, or used and official revision as its base (for instance, the "Against the Slave Lords" "super module", as opposed to the individual A1 - A4 releases). Another of my favorites is: "Liar liar pants on fire!"